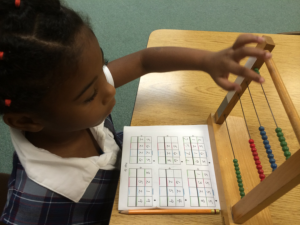 Montessori Education is a system of education developed to meet the needs of the child. The Montessori system offers a sensible, structured program that allows the child to develop at his or her own pace, using his or her own abilities, with the guidance of a trained, certified teacher and the use of specifically designed Montessori materials. The most important factor of any system of early childhood education should be the child. Dr. Marie Montessori bases her entire method on her observations and understanding of the child he/she is, not as adults imagine he/she might or should be. Dr. Montessori devised an entire environment to help the child develop him/herself as a total human being. This system of education allows your child to learn the easiest and best way. The child does for him/herself. Limits are set, and the child is free to exercise his/her sense of freedom and spontaneity within those limits. Gradually the child builds a strong sense of independence and self confidence as his/her skills increase. The Montessori method is built on your child’s natural love of learning and instills a life-long motivation for continuous learning. The environment of the classroom set-up is very important in the Montessori system of education. It is attractive and serves as a motivating element to self-teaching or auto education. It contains specially designed Montessori materials that are attractive, simple, child-sized and self correcting. In this environment, the child learns to work alone and with others. He/She learns to follow “ground rules” so that the classroom runs smoothly and that a climate for learning is always maintained. The Montessori classroom covers a number of areas such as language, mathematics, geometry, botany, zoology, practical life and sensorial education. These areas provide your child with aids for his/her intellectual development. Exercises in body movement assist your child’s physical development and increase his awareness of his/her body and what it can do. The Montessori teacher has many jobs to do. 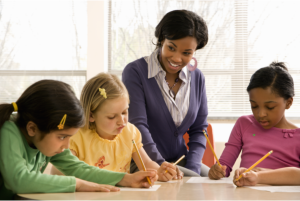 Unlike the teacher in a traditional classroom, the Montessori teacher is not the center of the classroom. Instead he/she is very often hardly noticeable in the room as the children are working. She has no desk and spends her time working with the children at a presentation table or on a rug. The Montessori teacher must be a keen observer of children in order to have a clear idea of each child’s individual level of development. The teacher then determines what materials are best for each child to work with. The teacher guides the child in this way and helps him/her learn the proper use of each material. By choosing Montessori education you are choosing multi-age grouping: The Montessori classroom contains children of different ages. By having this multiage grouping, each child is exposed to a wide range of learning possibilities. When the child first begins school, he/she will have the benefit of learning from older and more experienced children. Later on, the child will be able to help other children with learning skills that he/she has already mastered.